Do you live in Windermere? Windermere is a town in Orange County, Florida, in the United States. As of the 2010 census, the town population was 2,462. It is part of the Orlando–Kissimmee Metropolitan Statistical Area. Windermere was established in 1889 and chartered in 1925. During late 2007, the Town of Windermere filed a proposal to annex Isleworth and Butler Bay, a wealthy subdivision. This was met with extensive debate from town residents and an objection from Orange County, which stood to lose millions of dollars of property tax revenue. 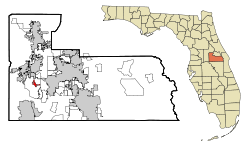 After lengthy discussions, and battles with the county, Isleworth remained in the county, but Butler Bay was annexed into Windermere, with over 90% of its residents approving annexation via a mail-in ballot. According to the United States Census Bureau, the town has a total area of 1.57 square miles (4.07 km2), of which 1.56 square miles (4.03 km2) is land and 0.015 square miles (0.04 km2), or 0.98%, is water. As of the census of 2013, there were 2,855 people, 784 households, and 591 families residing in the town. The population density was 1,688.2 inhabitants per square mile (654.0/km²). There were 723 housing units at an average density of 643.4 per square mile (249.2/km²). The racial makeup of the town was 95.68% White, 1.3%Black, 0.05% Native Americans, 2.00% Asian, 0.32% from other races, and 0.69% from two or more races. Hispanicor Latino of any race were 3.53% of the population. There were 704 households out of which 36.9% had children under the age of 18 living with them, 70.3% were married couples living together, 6.5% had a female householder with no husband present, and 20.2% were non-families. 17.3% of all households were made up of individuals and 6.7% had someone living alone who was 65 years of age or older. The average household size was 2.69 and the average family size was 3.05. In the town the population was spread out with 27.5% under the age of 18, 5.1% from 18 to 24, 25.8% from 25 to 44, 30.5% from 45 to 64, and 11.1% who were 65 years of age or older. The median age was 41 years. For every 100 females there were 104.2 males. For every 100 females age 18 and over, there were 96.3 males. The median income for a household in the town was $88,809, and the median income for a family was $105,737. Males had a median income of $80,693 versus $37,321 for females. The per capita income for the town was $51,370. About 2.4% of families and 3.1% of the population were below the poverty line, including 3.0% of those under age 18 and 9.1% of those age 65 or over. The schools include Windermere Elementary School and Gotha Middle School, Orange County Public Schools in Windermere, assigned based on the parent/guardian's home address. OCPS also provides school buses for local students. Windermere is also home to Windermere Preparatory School, a private, coeducational PK-12 college prep school.